Oklahoma Connection | Rainbolt is a lifelong Oklahoman. His ancestors moved to Tishomingo, Indian Territory in the mid 1800s. Today he maintains a personal retreat near Tishomingo on the Washita River. One of the sports Mr. Rainbolt participated in while at Shawnee High School was the rodeo team. David Rainbolt grew up in Shawnee and graduated from the University of Oklahoma and the Tulane University Graduate School of Business. After starting his banking career in Texas, he moved back home in 1982 and began working to modernize Oklahoma’s banking laws. He was CFO of the founding management team of United Community Corporation and, in 1992, became Chief Executive Officer of BancFirst, its successor company. 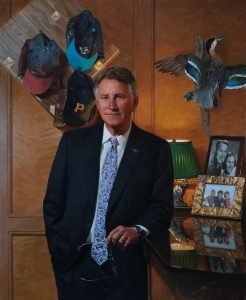 During his 25 years as CEO, the company went public, expanded into metropolitan areas, and closed 34 acquisitions, growing from under $700 million to over $7 billion at the time he became Executive Chairman in 2017. Outside of banking, David has been active in nonpartisan reform efforts, including civil justice, criminal justice, and common and higher education issues, most recently including Step Up Oklahoma. David’s civic involvement includes chairing the Oklahoma City Chamber of Commerce, Oklahoma State Chamber of Commerce, Last Frontier Council of the Boy Scouts, United Way of Central Oklahoma, the Children’s Center Foundation, Downtown Oklahoma City Incorporated, and Oklahoma Bankers Association. He is currently Chairman of the Dean McGee Eye Institute. David and his wife, Kim, have three sons, Adam, Sam, and Jake and two grandsons. He coached his sons’ little league baseball teams for twenty-four years. See pictures of David Rainbolt and other media HERE.